I have been busy attending conferences recently (one of many excuses for not updating the blog) and I thought I would mention one significant difference between these conferences and those that I have attended previously. 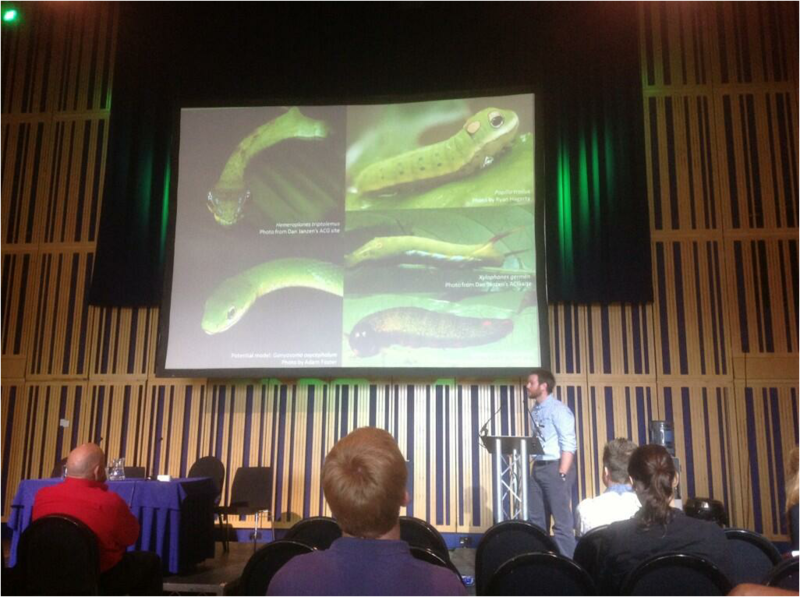 At Behaviour 2013 (Newcastle, 4-8 Aug 2013 – that’s me talking about mimicry on the right), I tried live-tweeting for the first time. Then at Intecol 2013 (London, 18-23 Aug 2013) almost all questions during the plenary talks were taken solely by Twitter. This meant that I had a lot more experience of Twitter in an academic forum that I had had before, and I found it to be an immensely positive experience! Not only did people come up and say “hi” because they recognised my name from Twitter (new networking opportunities), but I passively participated in multiple parallel sessions where usually I would only have had access to the session within which I was physically present (there were 16 parallel sessions at any one time at Intecol!). What you can see is that there are distinct peaks at Intecol around 11am (the BES Presidential Address by Georgina Mace) and 4pm (which was a provocative plenary about policy and science featuring some big names, including Bob May and John Lawton). Intecol pursued a fairly aggressive policy of Twitter use, incorporating it into the official talks as well as promoting its use at every opportunity. The result was a huge amount of engagement from people, and a great deal of discussion about its merits (and demerits, from some quarters!). 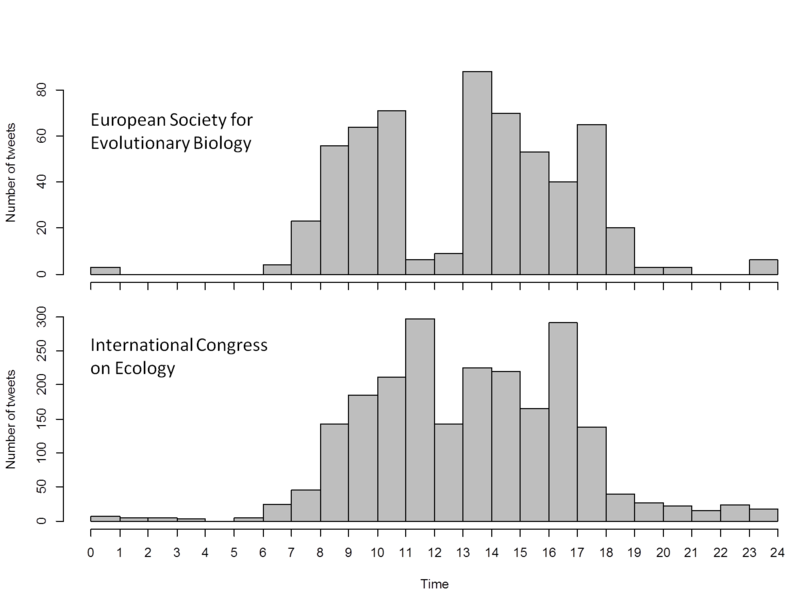 I’d be interested to hear whether the ESEB peaks and troughs can be explained? I assume that they coincide with plenaries as well? Aggressive Twitter promotion was successful at Intecol, providing huge engagement, but not popular with all attendees. Having Twitter usernames on name badges is a must if this is going to be a key way of interacting with fellow attendees. In particular, the use of Twitter for questions in plenaries was an EXCELLENT idea, keeping questions brief and focused, while removing concerns over anxiety about publicly getting up to the microphone. Live discussion within the community during the plenaries was fascinating as well – people provided links to papers that were cited, questioned assumptions, and even provided cricket scores! NB: Because tweets become inaccessible via the Twitter API after 5-6 days, here are the tweets from that day for posterity: ESEB and Intecol Tweets.